Our kit makes you a professional 40cm Drum Lampshade from the covering of your choice, that can be used as a Pendant (ceiling), or with a suitable table or floor lamp. 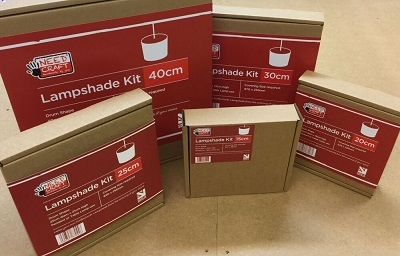 This 40cm kit is ideal for use with standard 1370mm wide furnishing fabrics. The lampshade frame included in your kit will fit the standard bayonet cap (BC) lamp, holder. 1 x Self-adhesive lampshade panel size 1276mm x 278mm includes 14mm kiss cut. 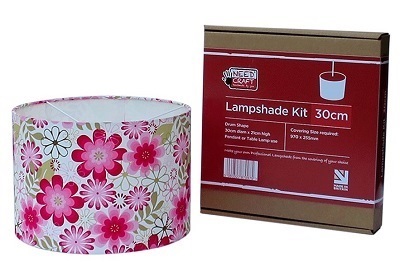 1 x Self-adhesive lampshade panel size 643mm x 206mm includes 14mm kiss cut.